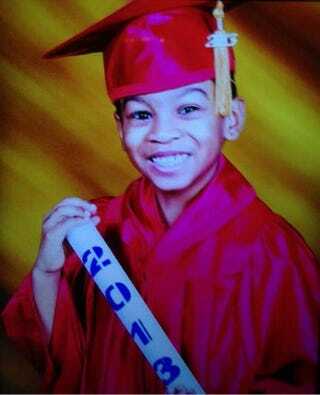 Prince Joshua Avitto was laid to rest on Friday, with family members gathered together to celebrate the brief life of the 6-year-old, who was stabbed to death on Sunday in the elevator of a Brooklyn, N.Y., housing project, the New York Post reports. According to the Post, P.J.’s father, Nicholas Avitto, has been walking the boy’s superhero backpack to his elementary school every day since the tragic stabbing, and Friday represented the last walk before he went to St. Paul Community Baptist Church to bury his son. New York Mayor Bill de Blasio and his wife, Chirlane McCray, were also at the 9 a.m. service to pay their respects. Just a few days ago P.J. was going down the elevator with his best friend, 7-year-old Mikayla Capers, to get some ice cream. On the elevator they were viciously attacked by an older man. Mikayla is currently recovering in the hospital after being stabbed 16 times, the Post notes. Police arrested Daniel St. Hubert in connection with the stabbings after he was found wandering around a Queens neighborhood with a knife that matches the one used on the children. St. Hubert is a felon who had been out of prison for only a week after serving a five-year sentence for attempting to strangle his mother, the Post reports. Police also suspect him in the fatal stabbing of 18-year-old Tanaya Grant-Copeland, who was a freshman at Long Island University. "I'm still devastated," Avitto said. "God got me through this week, the most high God. I'm hurting. I'm really hurting."